The Black Friday is a day of celebration as it marks the beginning of the first day of Christmas shopping season. In such a season of rebate offers, a celebration must be there to rejoice. The enjoyment of a party with family and friends is obviously, incomplete without a glass of a refreshing drink. However, when it’s about hanging out with a large gang of party makers, you will need professional mixologists and bartenders. After all, sharing and mixing cocktails by the inexperienced hands can be quite an irksome soggy experience. 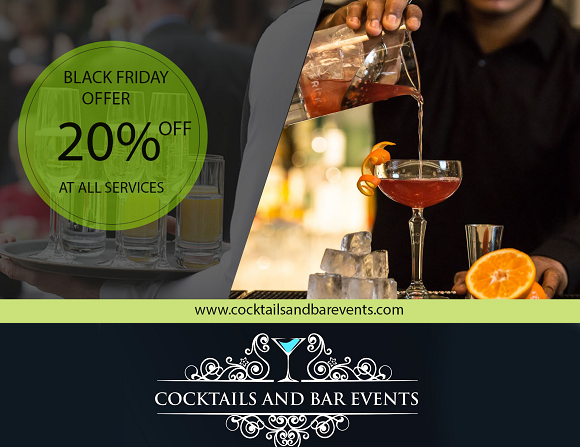 At our mobile bar, we are offering 20 % off at all services on Black Friday. Simply slide down the pages to learn more about it. Offers and discounts really pump up the mode of celebration. And, when it’s on the drink services, no one would want to miss this incredible opportunity, especially, on the Black Friday. For an organized drink service in the party, it will be a better idea to hire a renowned service provider. We are specifically, flaunting an alluring discount to all our clients on a special day. We have come up with the whole package of drink service to make the party simply a hit. Quality drinks, pro mixologists, and yes, a mobile bar - we have got everything in the combo. We have come with our brilliant customized service with an exclusive range of drink packages. All these come with a 20 % off at all services on Black Friday. Our professionals are expert in serving a supremely tailored drink service. Individuals can ask for the drinks they want to enjoy in the party and we will offer a spectacular service that goes excellent with your Black Friday party theme. 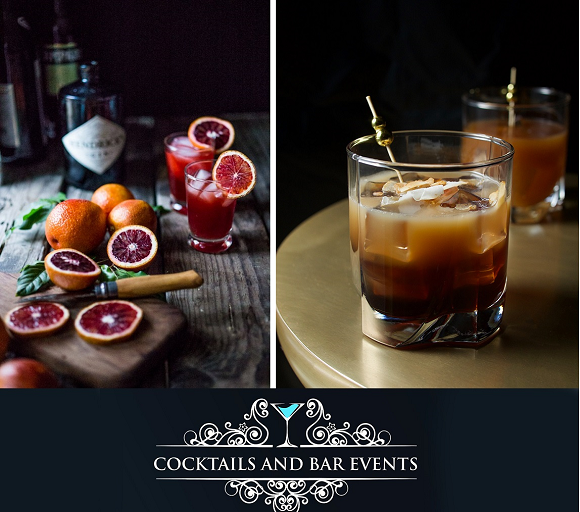 We, Cocktails and Bar Events is a renowned service provider in the country. We have come up with the offer of 20 % off at all services on Black Friday. For the convenience of clients, we are offering such a heavy discount on all our trio drink packages - silver, gold, and platinum. Hence, individuals must not spoil this chilled out Black Friday discount offer coming once in a year! Learn more about our service facilities by visiting the link cocktailsandbarevents.com. Individuals are also suggested to read other articles posted online to attain further information on the services. The mobile bar idea is fabulous. I have also booked one of the LA event venues for a success party and I am thinking about getting a mobile bar for the party and hire a barman. This would make things so easy and I will be able to look after other important things in the party. Hen party is popularly known as a bachelorette party. In these days, it has become a trend to celebrate hen party which is organized for the lady who is going to get married. Undoubtedly, it is a great fun for both the would-be bride and the bridesmaids. In other words, it can be said that hen party is the ultimate ladies night out. As wedding is one of the most special events in life, everything related to it should be celebrated in a unique way. A hen party is arranged prior to the wedding day for the ultimate celebration of the bachelor life. Are you looking for a professional bartender to make your cocktail party more organized? If yes, you must hire him from a reliable agency since this way you can hire a professional barman. If you live in London, you must know that hosting a cocktail party or other events is very common among the people in this city. And it is seen that most of the people in this city prefer hiring bartender to give charge of beverages. If you want to hire a professional cocktail bartender in London, you must follow some necessary tips. So, are you going to arrange a party for your birthday or marriage ceremony? Have you thought of hiring a barman? If yes, then it sounds really great. Nowadays, it has become a modern trend in London to hire a professional bartender for add a rocking mood to their party. Hiring a bartender not only helps you to enjoy the party with a relaxed mind but also makes your guests impressed upon you. It will also enable you to experience an unforgettable party with the help expert bartenders. But, if you are planning to hire a cocktail bartender in London, you should check some of the parameters. As arranging a party is nothing but a great deal, you need to check each and every detail before the party. So, let’s go through the next part of this article to know about clearly in this context. What should you check at the time of hiring a bartender? To get the worth of your investment, you should check the following parameters.